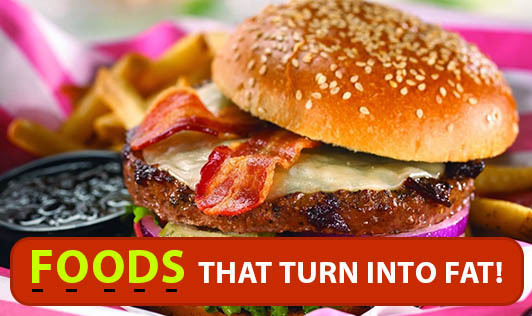 Foods That Turn Into Fat! Let’s take a look at the list of those foods now! Fried foods (obviously), like samosa, vada, fried chicken (sorry KFC lovers! ), pakodas, bondas, all varieties of chips, nachos, French fries, etc. Bakery products like white bread, biscuits, cookies, pastries, cakes, brownies, donuts, veg puffs or chicken/mutton puffs, etc. Packaged fruit juices with added sugar. Carbonated beverages including sweet soda! Fried foods, if homemade, can be much less dangerous than those you get in restaurants, as the oil is re-used, making it all the more unsafe for us. But mind you, anything fried at home also should be consumed in limits! Foods which majorly contain sugar or maida (too much of it - all simple carbohydrates) and vanaspati/dalda ghee are number 2, 3, 4 and 5 from the list. When we eat simple carbohydrates, more than required, it is converted to a specific form of fat named triglycerides. Soda? Really? Well... yes! Sweet soda and the other carbonated beverages contain sugar (too much of it). It also contains what you throw out with every single breath... carbon dioxide. So, are you thinking about which foods to choose for a bulging belly or which foods to choose for a flat belly? Think.... it's your own body!